All aboard, foodies! Dishcrawl has arrived and it’s taking over major cities all across the U.S. with a food concept that allows you to “crawl” your way through several restaurants in one evening. The experience allows you to sample from diverse menus that represent small touchstones of the city you’re dining in. Lucky for us, Dishcrawl Miami kicked off in April 2013 with culinary tours of Brickell, and we were part of their first Midtown Miami food crawl. For $45 (includes tips but not tax), Dishcrawl gives you the opportunity to sample pre-determined meals from four restaurants, which are kept secret until your arrival at the location (details on your first stop are given via an email upon payment confirmation.) You’re greeted with a smile and a nametag, at which point you’ll start to mingle with hungry strangers who are all anticipating the undisclosed meals and locations. Chef Michael greeted us at this southern comfort BBQ joint that host’s funky décor and neon signage. The almost awkward dichotomy of the food and ambience (old and new) are long forgotten when you bite down on the St. Louis Ribs. The food is all comfort and taste; it’s simply mouth-watering good. The Brisket Slider was also delicious. Both meat dishes were high quality, tender and juicy. The Macaroni and Cheese were light but not at the expense of taste. The dish wasn’t the thick and overly ambitious creamy type, but rather soft-textured pasta with just the right cheese drizzle that fulfilled our hungry stomachs. Our dish was also exactly the right size. Although our appetite was ready for over indulgence, we had three more stops to discover and on we went. We had heard great things about Machiya, the Japanese Asian fusion restaurant located at the Midtown Shops, so were excited! We were served a visually stimulating plate that brought chicken lettuce wraps, Hokkaido Ramen and a tiny Machiya Japanese taco. The chicken lettuce wraps were an interesting taste of Asian fusion, but not exactly memorable. The noodles however, made up for the rather lacking wraps. The Hokkaido Ramen noodles were bathed in a creamy, spicy broth that was absolutely delicious. The Machiya Japanese taco came with raw tuna, guacamole, crème fraiche, eel sauce, and jalapeño. The taco was a great twist on the dish and a sure sign of the Machiya’s culinary personality. Our final stop at Kouzina proved to be the highlight. The small and cozy restaurant was incredibly charming with its inviting ambience and impressive knotted bar. We enjoyed small appetizers of hummus and tzatziki alongside warm, seasoned pita bread before taking on our sampling menu. Kouzina’s treats included: Bacalao Croquettes (a strong fish croquette that was bursting with flavor); Manouri Cheese Envelope (a sweet, savory pastry with sesame seeds and wild mountain honey); and Grilled Keftede (a Greek take on meatballs with feta and mint). The combination of this menu outdid the others. We were able to leave with a real sense of the restaurant’s talent to cook a variety of items and were pleasantly surprised by all. Although it got a tad bit too late to visit our fourth and final location, Dishcrawl brought over our dessert in the form of gourmet popsicles from Feverish Pop. Tested by having to settle on only two flavors, from a selection of more than 15, we narrowed it down to Basil Pineapple and Strawberry Banana. The gourmet pops were the perfect refreshing treat to a long night of dining. They also left us wanting to make impromptu summer trips to the brick-and-mortar location that’s just recently opened at the shops in Midtown. Admittedly, the tour is still dealing with a few hiccups. At the second stop, our food took longer than anyone would have liked and the overall dining experience was about four hours long. That said, we were in good company and enjoying good food, so the mishaps were easily overseen. 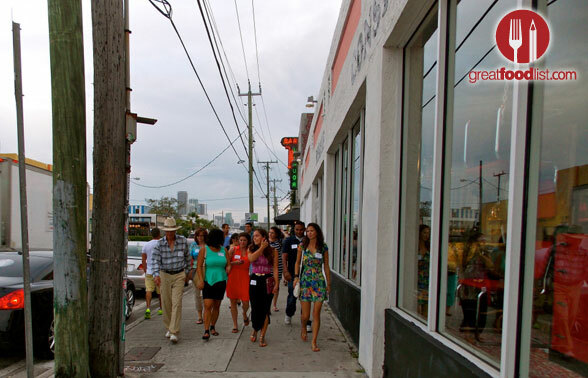 If you’re a hungry Miami resident looking for a culinary adventure, Dishcrawl is for you. 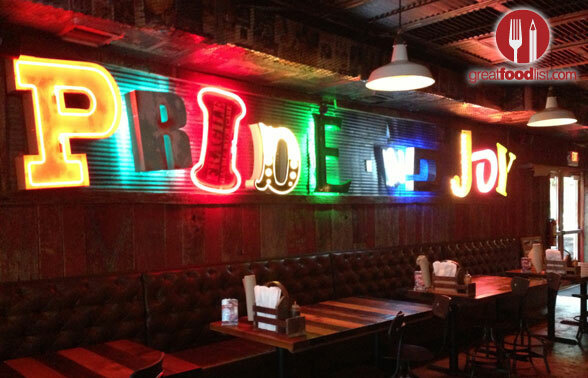 You’re guaranteed to meet fellow foodies, enjoy a wide-array of vibrant food and have some genuine, laid-back fun. Sure.. try these on twitter @FatgirlHedonist @mariasgoodtaste @greatfoodlist @BurgerBeast @MIACulinaryTour @SoFLBrgOverload @EdibleSoFla @Foodiechats. If you don’t have twitter, at least you can grab their websites off their public profile.